Diagnostic Imaging tests are a collection of diagnostic methods that allow doctors to examine your internal organs and tissues noninvasively. Diagnostic imaging uses imaging technology to view the inside of the body from the outside, and it displays the findings via still or moving pictures. Each imaging test utilizes specific machinery to create images of the inside of the body. Each test has its own benefits. Your doctor will decide which imaging tests are the most appropriate for you, based on your symptoms, medical history, genetic factors, and lifestyle choices. An ultrasound test is used very commonly for liver evaluation. An ultrasound emits high-frequency sound waves that reflect against the targeted surface of the body. When used for examining the liver, a small tool is placed on the skin in the region of the liver. The reflected sound waves create images that are transferred to a computer for closer inspection. The ultrasound can be effective in recognizing changes or abnormalities in the liver, and is a noninvasive diagnostic tool not known to pose any risk to the patient. Ultrasound tests are typically inexpensive and offer a readily available method for liver imaging. A CT scan uses a scanner attached to a computer that transmits X-rays to create images of the inside of the body. The scanner takes very small images of the body in "slices." Each photographic slice is saved to the computer for analysis . In some instances, a patient must drink a special edible dye called contrast material to highlight the liver for more detailed images. CT scans are used to assist in diagnosing liver disease. During the test, you will be instructed to lie down on a table that is attached to the scanner. The scanner is large and tunnel-shaped in order to permit your body to pass through. A radiologist will conduct the CT scan and will instruct you to stay very still for the procedure. At this point, the scanner will begin to move and take pictures. A CT scan lasts 30-60 minutes. The procedure does not cause pain, although some people feel nauseated from drinking the contrast material. If you experience any adverse reactions after your CT scan, be sure to speak with the radiologist or your doctor. There are some risks associated with CT scans. It is always important to speak with your doctor about possible risks or about any concerns you may have. 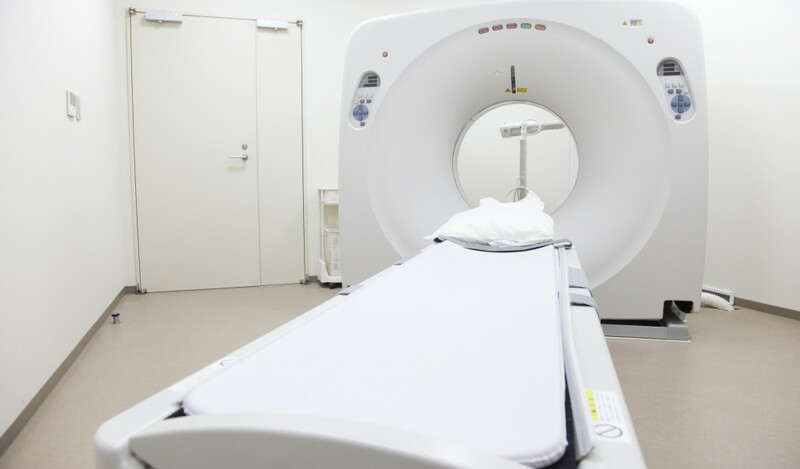 A CT scan can interfere with certain medical devices or interact with certain medications. Prior to a CT scan, talk with your doctor about any medications that you are taking or have recently taken. Women who are pregnant are typically advised not to undergo CT scans. Because a CT scan uses X-rays, your body will be exposed to some amount of radiation. If you have concerns about radiation exposure, please discuss them with your doctor. Initial results from your CT scan may be available to you immediately following the procedure. Often, though, it takes a couple of days to receive a complete assessment of the results. MRI is a diagnostic procedure that uses powerful magnets and radiowaves to create images of the inside of the body.The radio waves are absorbed inside the body and translated as images. MRI produces no radiation. In the procedure, individual images referred to as "slices" are created and stored on a computer. These slices are small and numerous, creating a highly detailed picture of the liver or other organs and tissues. During the procedure, you will be instructed to lie on a table that passes through a tunnel-shaped machine: the MRI scanner. For accuracy, it is important to stay very still while the scanner is recording images. In some cases, an injection of contrast dye is administered prior to the MRI. This highlights the liver or other targeted area for better photographic results. MRI is widely used and involves fewer risks than tests such as X-rays and invasive biopsy procedures. MRCP is a specialized MRI that creates images of the liver, gallbladder, bile ducts, and pancreas to evaluate them for damage, disease, and infection. MRCP is a non-invasice procedure, and is very useful for diagnosing liver disease. A liver scan is an imaging technique that is used to assess liver function, diagnose liver conditions, and monitor the effectiveness of treatment. For the test, a very small amount of radioactive fluid (radiopharmaceutical) is injected into a vein. Once the radiopharmaceutical has circulated through the bloodstream and reached the liver, a large scanner can interpret the fluid as an image. Doctors observe this image to reach a diagnosis of conditions such as cirrhosis, hepatitis, cancer, abscesses, liver enlargement, and portal hypertension. The very small amount of radiopharmaceutical material is injected through an IV in the arm. It is considered safe and does not pose a threat ofradioactivity.Some individuals experience discomfort resulting from the radiopharmaceutical. In rare cases,individuals(especially those with latex or contrast dye allergies) may experience allergic symptoms from the radiopharmaceutical. If you have an allergy to latex or contrast dye, please notify your doctor. Pregnant or nursing women should not have a liver scan. Speak with your doctor if you are pregnant, believe that you may be pregnant, or are nursing. Prior to the procedure, a doctoranswers any questions you may have. Fasting and sedation are not usually necessary for the liver scan procedure. A gown is provided, and all jewelry and clothing must be removed prior to receiving theliver scan. A medical professional inserts the IV to administer the radiopharmaceutical. You must lie still on a table so that the liver scan can create accurate images. For 24-36 hours after aliver scan, it is important to drink a lot of water; this helps flush any remaining radiopharmaceutical from the body. Patients should feel ready to resume normal activity after the liver scan. Doctors may provide different after-care instructions based on your specific needs. Be sure to follow the instructions provided by your doctor. FibroScan® (Echosens) is an imaging technique designed to measure the stiffness of the liver that is associated with fibrosis. It is a simple, non-invasive procedure that produces immediate results. An abdominal X-ray is an imaging test used to observe organs, bones, and tissue in the abdomen in order to identify the cause of unexplained abdominal pain and nausea. It may also be used to confirm the presence of blockages in the gastrointestinal tract, gallstones, and tumors. X-rays emit low-level radiation that is generally regarded as safe for most people. Many experts believe that the benefits of X-ray imaging outweigh the potential risks for radiation exposure. Pregnant women should not undergoX-ray testing. Speak with your doctor about other options if you are pregnant or think you may be pregnant. The X-ray procedure requires youto lie on a special X-ray reactive table. Youshould remove all jewelry prior to the procedure. If you have an IUD, tell your doctor prior to the procedure. The X-ray machine will be positioned over the abdomen. For clear pictures free of motion blur, youmust momentarily hold your breath while the image is recorded. Prior to X-ray, talk with your doctor about any medications you have taken within the past 7 days. Prior to the procedure, notify your doctor of any recent X-ray procedures you may have had. ERCP is a diagnostic imaging procedure involving a lighted camera placed in the body to diagnose or monitor liver, gallbladder, and bile duct problems. While the patient is sedated,the ERCP (tube with a very small camera attached) is guided down the throat to the stomach and small intestine. The ERCP displays images on a video monitor. Doctors sometimes insert a special dye (contrast material) to highlight passageways and targeted areas. ERCP can locate and remove gallstones.